Reminds me of the old (1979) Steve Martin movie and the classic “The phonebook’s here! The phonebook’s here!” scene. 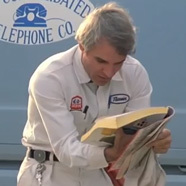 The main character’s (Navin Johnson) reaction at the arrival of the new phonebook was certainly memorable and entertaining. Read More at LinkedIn.